The healing benefits of wild Oregano oil may be attributed to its powerful anti-inflammatory, anti-microbial, and antifungal, antioxidant, digestive, antibacterial, and antiparasitic properties. 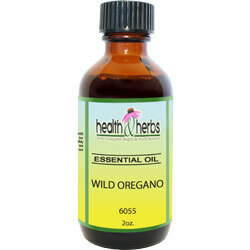 The essential oil of Oregano is often used for bacterial infections on the skin and to protect food from bacteria. It is a plant that is native to a higher altitude and is known as "Delight of the Mountains". Oregano oil is highly respected for its antimicrobial properties and has been used traditionally for aromatherapy, and in very small quantities, as a dietary supplement, when added to a beverage, Organic coconut oil or honey. Recent studies have shown that the herbal oil of Oregano may kill MRSA, listeria, and other pathogens. Oregano essential oil may be used for respiratory ailments like colds and other viral infections. The Oregano used for making the essential oil is not the same as the oregano spice you put on your food. Wild oregano, medicinal grade, is distilled to extract the oils and to preserve its healing compounds, and it takes over 1000 pounds to produce just 1 pound of the essential oils. One of the compounds of wild Oregano, carvacrol, is the most important one and is why the Oil of Wild Oregano is so potent. Over 800 studies have been done on the herbal oils potential benefits for parasites, fungal infections, bacterial infections, viruses, inflammation, tumorous growth, allergies, Candida, and has shown amazing antibiotic benefits. One study evaluated the activity of Oregano against five different types of bacteria. The herbal oil was shown to have a significant effect on these harmful bacterias, especially E. coli and salmonella. The research suggests that the Oil of Oregano, origanum offers such amazing benefits may be used regularly to promote gastrointestinal health and to help prevent deadly food poisoning. Instructions: Use 3-6 drops, 3 or more times daily. Do not use undiluted on skin. Shake well and store in cool, dark place. Keep out of reach of children. From Anonymous of Riverside, California on 3/5/2018 .